Talk about taking your work home with you. In this example, bride Satoko Inoue, who works for the company that created the i-Fairy robot, married her client Tomohiro Shibata yesterday—with the i-Fairy acting as registrar to the couple. 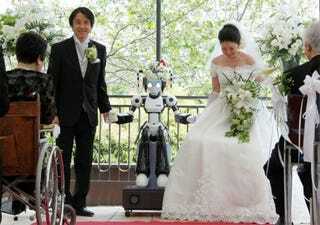 While they weren't stranded in an airport and forced to get married over Skype like this couple, Inoue chose to have an extremely high-tech wedding to show how "robots would become more integrated into people's everyday lives."